Roll up! Roll up! Khalid and I manned the Stratford shift this time. We served hot soup, baps and water to 40-50 visitors who came by our stall. A couple also gave me a fiver for One Third to use on food and water. There were a group of three school lads who said they were staying up all night in the Stratford Centre. I told them to go home and chill. The area is not safe at night and I hope they took my advice. Where the hell are their parents?? The weather was warm and people were generally in good spirits. 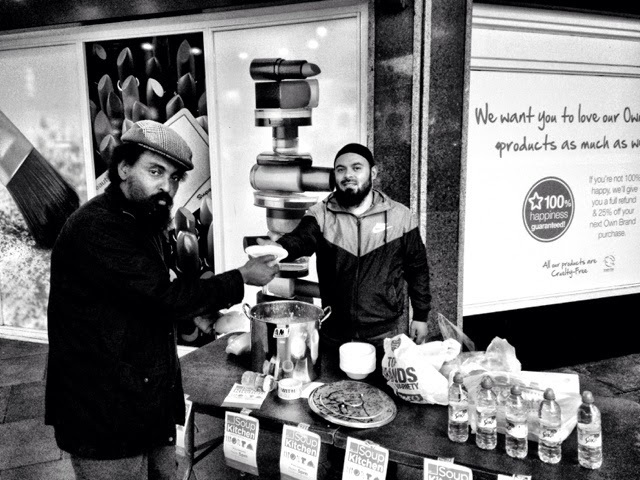 My mate Ranu has kindly offered to fund biriani for the stall. Now that would be an awesome culinary treat for a Saturday night. Ladies on Friday and the gents on Saturdays from 8-10 pm. Do pop over and say hello.